With a 5:30am wake up call, the group was determined to reach the finish line! Not to mention our ride back to Port Renfrew was scheduled to leave at 12pm. Leaving the campground, we had two brief scenic stops at the Pachena Lighthouse @ KM 10 and the Sea Lion Rock @ KM 9. Definitely 2 stops worth checking out along this leg. Once we got back to it, the trail was flat and relatively easy as we’d be passing a kilometer marker every 20 minutes. It was the complete opposite of day 1, so we were all happy we decided to have the hardest part of the trail done on the first day as opposed to the last. However, once we reached the last kilometer, we had ran into a significant fork in the road. We had the choice between the beach or trail. With Brock leading the way at the time, he choose the trail. Unsuspectedly, this meant we had to climb a lot of giant ladders and hills. So next time, I highly recommend the beach trail for the last kilometer…. But after all that cursing during the last 30 mins, we finally reached the end! Having finished the trail after 6 days, we naturally all gave each other a few high fives. We were also greeted by two friendly National Park attendants at the WCT Office who also congratulated us. With the West Coast Trail conquered, it was definitely time to go home. First we had to get to Bamfield which was 5 km away. There was no way were going to walk another 5 km so we opted for local Taxi services which charged $10/person. At this point we were will to pay anything. Since there was no cell phone service at all, we honoured ‘Throwback Thursdays’ by using a pay phone. It’s a good thing we all had change on us. Once the taxi dropped us off in Bamfield, we had an hour to kill, so we didn’t hesitate to eat some freshly made Breakfast at the Market Café and of course had to have celebratory breakfast beer! Getting back to Port Renfrew, there were 2 options: bus or boat. The bus ride would be a 4 hour trip filed with other sweaty hikers along a narrow bumpy road. The water taxi boat would be a 2 hour ride next to the coast with a scenic views of trail and wildlife. We opted for option 2. 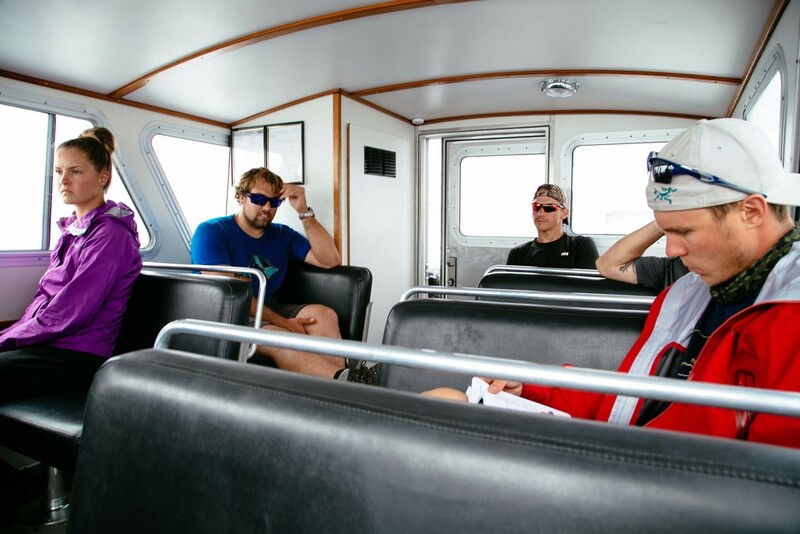 We booked the water taxi ride through Coastal Sea Adventures, it did cost a little more than the bus, but we thought it was money well spent. Luckily, for those who were awake for the ride, got see tons of birds and even a close encounter with a grey whale! With our journey through the West Coast Trail completed, I can tell you that it was definitely eye opening and an experience of a life time. It was a challenging for sure. The trail did push each and everyone of us to the limit and there were plenty of times when we would be out of our comfort zone. But nothing could replace the sights, friendships, and experiences over the last 6 days. Unlike previous days, waking up was a little tough. 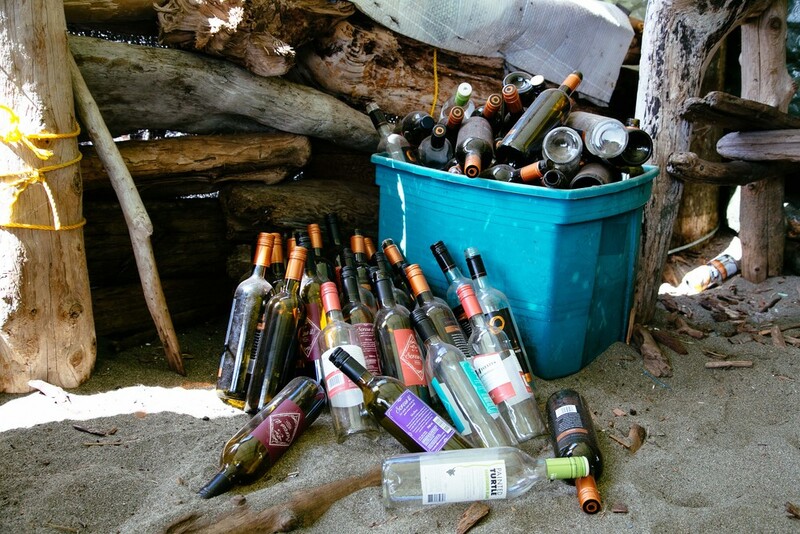 Our bodies were a little worn out and our energy levels weren’t as high, plus most of the boys were determined to finish all the liquor last night just to shed some weight. But hey the sun was shining and we were more than 2/3 of the way there! Getting back to the trail, we definitely used our ladder climbing skills to good use with several flights ahead of us. Once the group reached the top, it wasn’t too bad of a hike, the trail was relatively flat with a few obstacles such as the Klanawa River cable cart crossing. We also found a few relics along the way such as the abandoned donkey engine (once used for hauling logs to construct the trail), a rusty anchor on the rocks, and a boiler from a steamboat shipwreck. At the end of the day, the group reached Michigan Creek (named after the steamboat whose rusty boiler sits next to the camp). This camp seems to stand out a little more than the rest due to the fact it’s littered with carved buoys. They are literally hung everywhere on site. 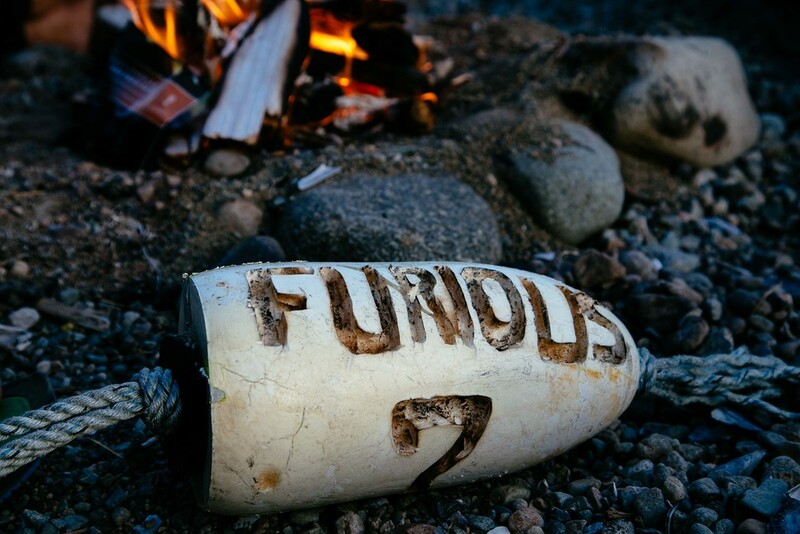 Since buoys and floats seem to wash up on shore throughout the trail, hiker’s tend to personalize their own as a way to signify their accomplishments of either finishing the trail or a rite of passage depending on which direction on the trail you’re headed too. Plus since hiker’s aren't technically allowed to take anything from the trail, so it’s a symbolic way to say you were there. Seeing that this would be our last night, Brock took the opportunity to put the final touches on his hiking stick with a few significant markings such as 75 notches for the 75 km of the trail and a whale for the wildlife that we saw. With today’s hike at roughly 17 km to Tsuiat Falls, it was going to be one of the longest hike in terms of distance. We also had to contend with the fact there was a "no drinking water" advisory for the next 13 kilometres. All the creeks were completely tapped out due to the extremely dry summer. So definitely a few challenges ahead, but nothing we couldn't handle. Leaving Cribs Creek, the terrain was fairly steady. Even the beach wasn’t so bad with only having to walk mainly on rock and shale. From KM 38 on, the path was quite easier than the past few days with only flat terrains and newly constructed boardwalks. So new you could even smell the cedar as you walk past it. There was even a helicopter was air lifting fresh piles of wood onto the trail. Past all the construction, we soon arrived at Nitinaht Lake, known to most hikers as the Crab Shack! Unlike the Burger Shack, this place served food that was no more than 20 mins old. Here we had the option of a salmon filet w/ a baked potato or the popular choice of dungeness crab ($25). They usually have other seafood items on the menu pending on the day and what's been caught. Beers ($7) and bags of chips ($1) are also offered, but not as extensive as Chez Monique's. If crab happen to be your food of choice, you'll likely see your crab pulled out of the "trap", gutted, and brought to the kitchen for a boil bath! Those of us who did choose the crab didn't have any regrets, some of us took our time dissecting and savouring it, others wasted no time in chowing down. Either way, the crab was definitely worth the purchase! With our seafood cravings satisfied, it was time to hit the road. To get back on the trail, we would have to cross the Nitinaht Narrows using the ferry service from the Crab Shack. Once we got back to it, the trail was back to the familiar terrain we all loved to hate, which meant climbing up and down steep hills. So we didn’t hesitate to get on the beach the first chance we got. Back to the beach, we also encountered another landmark at the Tsuiat Point, otherwise known as the “Hole in the Wall”, which literally was a hole in the wall. Definitely a great resting stop to cool off from the sun. From there we continued on the beach to Tsuiat Falls. This would be my favourite campsite of the WCT. We found a VIP spot with a neat campfire set up and right next to the falls. The waterfall is also a great place to take a dip and a quick shower, especially after walking in the scorching sun. The only negative aspect to the campground would be the only clean water source coming from the waterfall itself, so it wasn't easy gathering water compared to the creeks from previous campsites, but it was still manageable. It even gave Dustin the opportunity to use his rain gear for the first time when collecting water at night. Throughout the beach, it was evident that there were a lot of buoys carved out by past hikers. So Brock to it upon himself to personalize our own buoy. 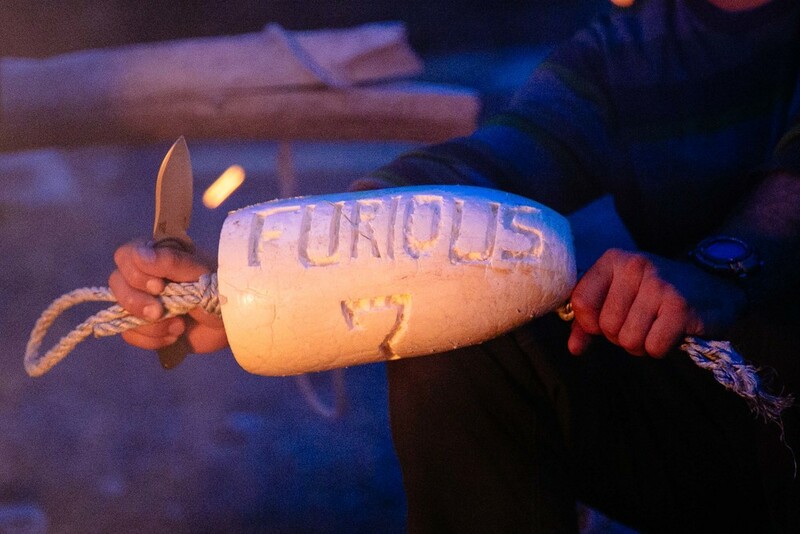 We wanted to immortalize our legacy on the WCT, so it was decided to carve out "Furious 7". "Furious" since we were all a pretty fast and determined group since we passed and overtook a lot of hiker on the ahead of us on the trail, plus there were seven of us, so it made sense to be the Furious Seven! Day three meant we were half way there. Today's agenda forces hikers to take the scenic route through the beach. We had no idea what lied ahead since we were pretty much used to walking through the humid rainforest and a brief walk through the beach on day one. Nonetheless it didn't matter though, most of the group wanted to try something other than ladders, logs, and hills at this point. Walking out of the campsite, the conditions were a bit foggy with low tides. The terrain was definitely different that the usual hiking trail as well. You had a couple of choices of where to walk on - Dry Sand, Wet Sand, and the hard bottom near the shoreline. My recommendation would be to walk on the hard bottom during low tide. The dry sand was a bit tricky since your foot would sink into the sand, which made walking difficult, but the wet sand made it easier since it was a little harder and compact. Gaiters were also a necessity at this point since they helped shield your lower legs/pants from getting wet and having any sand and/or water sneaking into your boots. Once we reached the final shipwreck at Bonilla Point, the lighthouse at Carmanah Point became visible from the distance, which meant we were also close to “Chez Monique” aka, the burger shack! 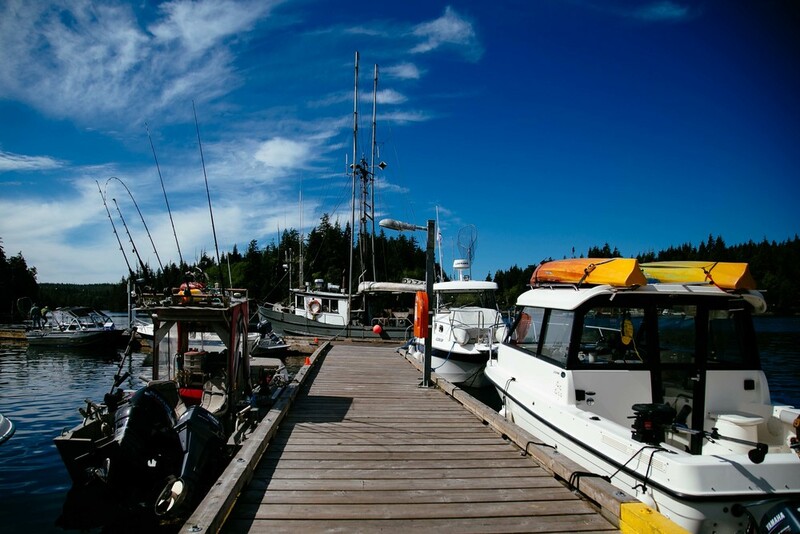 Located near KM 44, Chez Monique would be one of two food stops on the West Coast Trail. The other being the crab shack (more on that on Day 4). This pit stop is strategically located in the middle of the trail when hikers have been craving for something other than freeze dried meals. It's definitely made an impression on most hikers. Pretty much every other person we've ran into has hyped up the burger shack since day one. The only catch was a burger would set you back $20, so a fresh tasting meal was not cheap at all. With the anticipation of eating a burger since we began the hike, we were all willing to pay anything to eat something other than our packed meals. As we arrived at the burger shack, we didn't hesitate to order right away. As mentioned, a burger w/ coleslaw would cost $20, plus an additional $2 for bacon, cheese, or mushrooms. Or you can have all 3 toppings for $5. Another item we were all craving was beer! That went for $7 and a tallboy for $9. Luckily they sold them cold. We also packed a few for camp later that night! For those hikers who were low on supplies, Chez Moniques also sold snacks, chocolate bars, candy, and toilet paper. 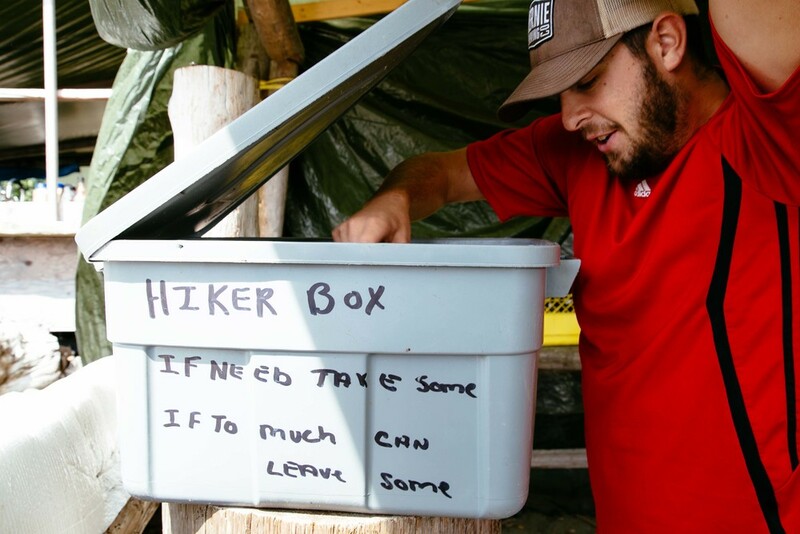 There’s even a “hiker’s box” were you can swap one item for another. (freeze dried meals, fuel, etc.). It’s also a great way to drop some weight from your bag if you packed a bit too much. While waiting for our burgers, we chatted and socialized with a few hikers who gave us advice and tips on what to come for the next couple of days. As our burgers arrived at our table, each one of us didn't hesitate to pig out! It wasn’t the best burger I’ve eaten, but it did satisfy our cravings. After indulging on burgers, beers, and candy and taking the time to relax, we eventually made our way to the lighthouse for a quick tour. It's pretty neat to still see it operational and maintained to this day. There is also a guestbook for hikers to document their names, which we were happy to sign on the way back to the trail. Day one had come and gone and the most difficult part of the hike was in the books, so with that behind us, were anxious yet excited to overcome day two’s set of obstacles. If you haven't guessed, today would be known as the "ladder" day. 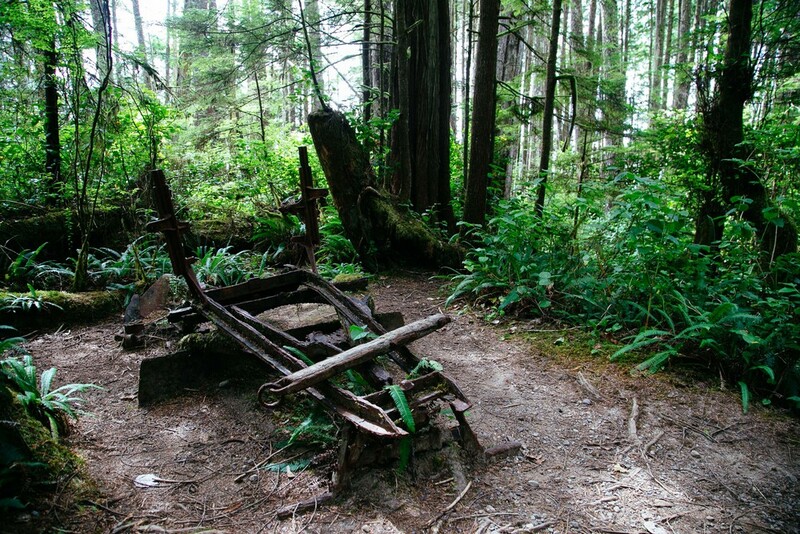 The next 9 km from Camper Bay to Walbran was known for the many ladders along the trail. So with our bags packed and our legs stretched, we were ready for our first set of ladders leaving Camper Bay and for the numerous more to come. The trail definitely had its fair share of ladders, which were not easy as at all. Whether we would be climbing up or going down, a few were a bit daunting but thrilling to climb. Some were even as high as 25-30 stories! Even when we thought it was fairly easy going down a set, we found ourselves climbing roughly the same height up. After about 4 km of balancing through logs and gripping our hands on hundreds of old wooden rungs, we stopped for a lunch break and found our way to the Cullite Creek campsite. Although this campsite wasn’t as big as Camper Bay, it was still quite the campsite. The sun was definitely shining and the ocean front view made it a great rest stop. Another camper was also kind enough to let us know that there was a pool around the corner. Once we fueled up on delicious freeze dried meals, we took advantage of the nearby pool to cool off and scrub away the dirt & sweat that accumulated from the hike. It definitely felt great since the weather was scorching hot that day. Sadly my waterproof camera had died and couldn’t take any photos at the pool. Now that we were rested and cleaned up, we continued our journey to Walbran Creek. 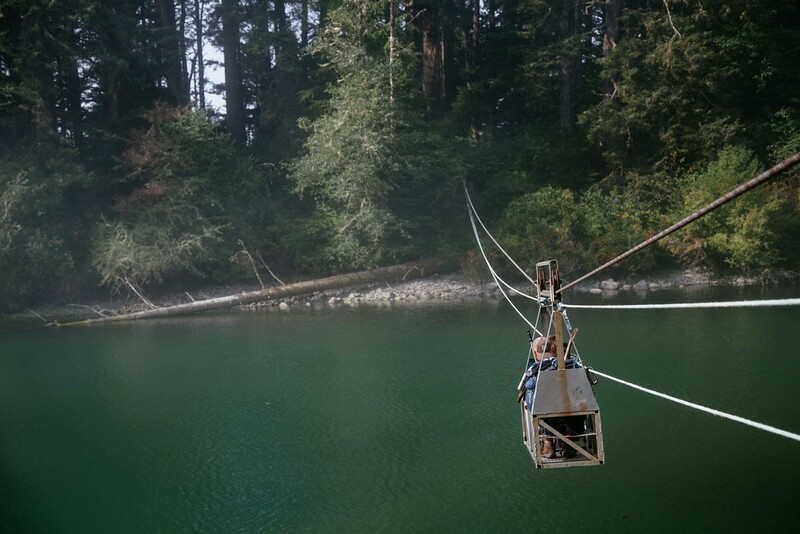 One thing that did stand out would be the suspension bridge at Logan Creek. It’s definitely a marvelous structure and quite the experience to cross. Apparently Logan Creek used to be a campsite as well, but was succumbed to a mud slide a couple years ago, so the beach is now closed off to hikers. After conquering the abundant amount of ladders, we finally reached Walbran Creek. We found a great spot on the hill right against the shore to park our tents. The group was a bit worried about the high tide hitting the tents, but it didn’t affect us at all. This spot also had a couple logs to sit around a fire pit to eat, have a drink, and relax. 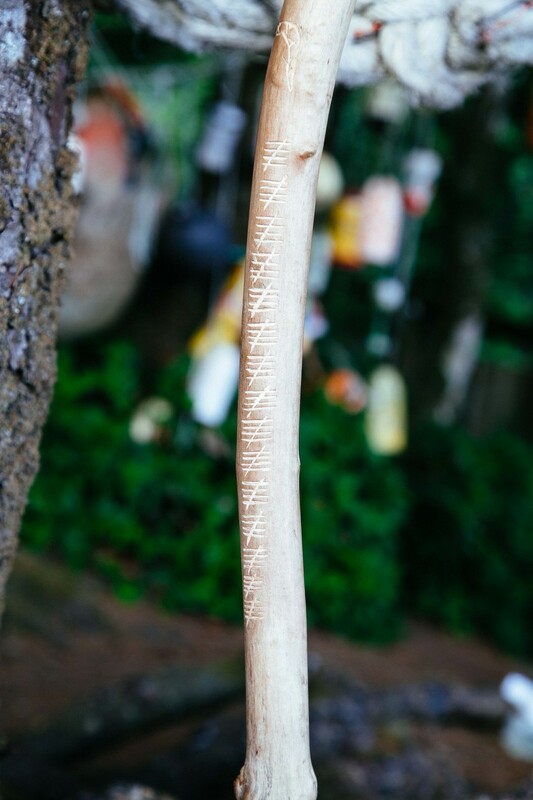 Brock’s even been passing the time by carving out a few markings on a hiking stick he found on the trail. A couple neat markings on the stick would be the “WCT 2015” branding and a tally of how many kilometres we’ve hiked. 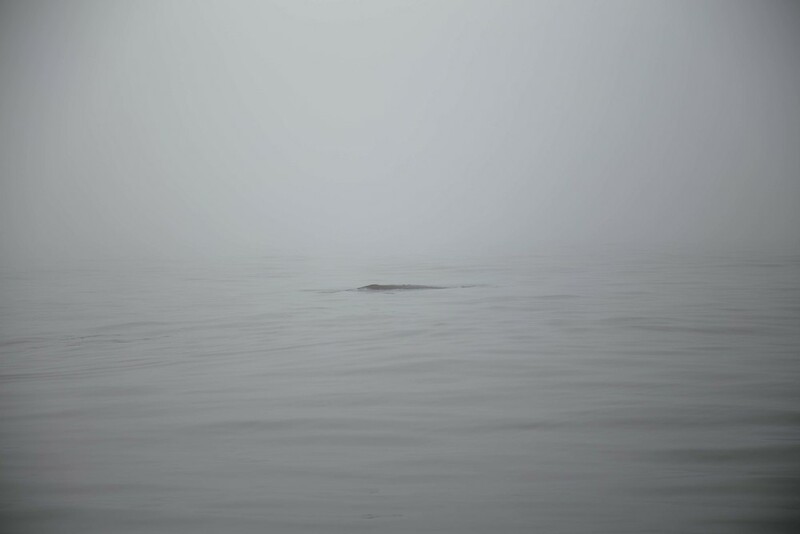 We even had the opportunity to watch not one, but two whales just chilling a couple hundred meters away from the beach. 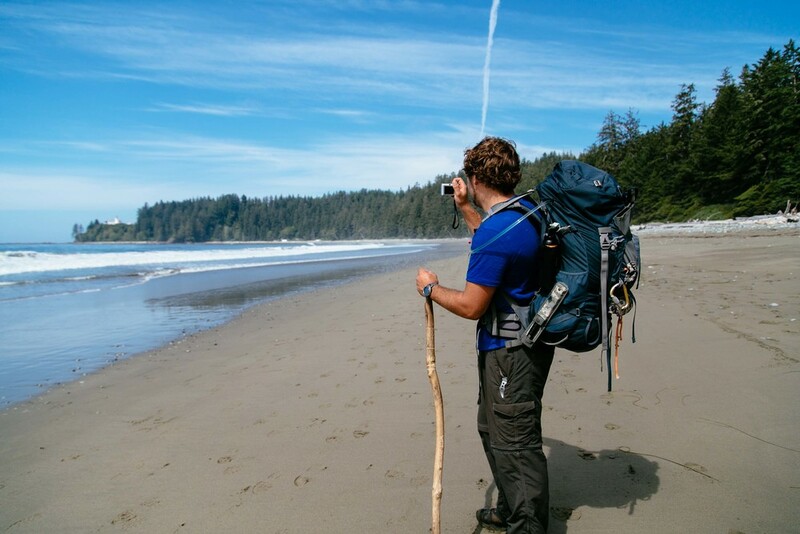 One of the most popular hikes in western Canada would have to be The West Coast Trail. 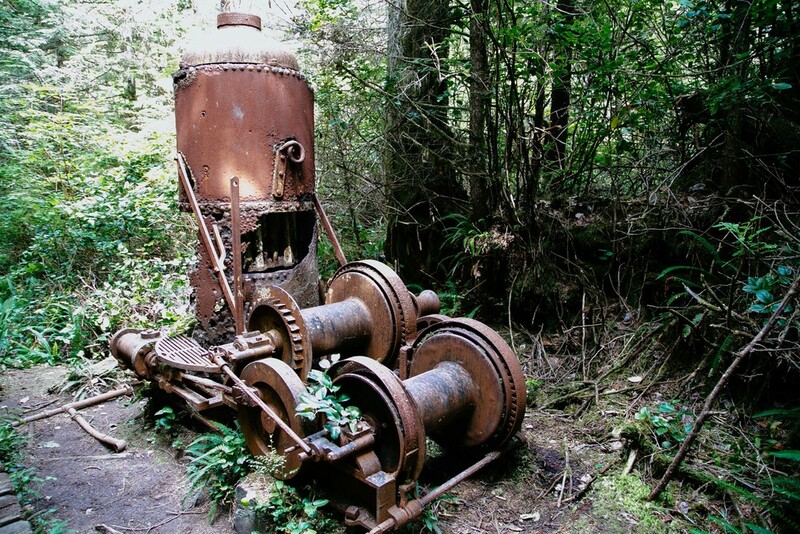 Located on Vancouver Island, the trail is a 75 kilometer stretch from Port Renfrew to Peechena Bay where hikers can explore the temperate rainforest, sandy beaches, Canadian wildlife, and historical shipwrecks. Having done the Inca Trail in 2014, the West Coast Trail (WCT) was next on my bucket list. When my coworker asked me to join him on the WCT, I didn't hesitate to say yes! Plus there were 5 other strong willed and awesome people joining us on our quest! So after weeks of planning, today was the day! We opted to start the hike at the Port Renfrew Trailhead as opposed to Peechena. The reason being: A) We wanted to get the hardest part of the hike done and over with it, B) We'd have the excitement, energy, and stamina at the beginning, even with a heavier bag, and C) We wanted our last day to be an easy hike with flatter terrain. Before starting the trail, hikers must attend a 1 - 1.5 hour information session. Daily orientation sessions were scheduled at 10am and 2pm, so instead of having to wait and start late in the day, our group opted to attend the orientation the day before. So with the orientation checked off, we were good to start the hike first thing in the morning. We also had to make the 8:45am ferry to cross the Gordon River. As soon as we got to the WCT Office, we parked our vehicles and eagerly packed our gear. 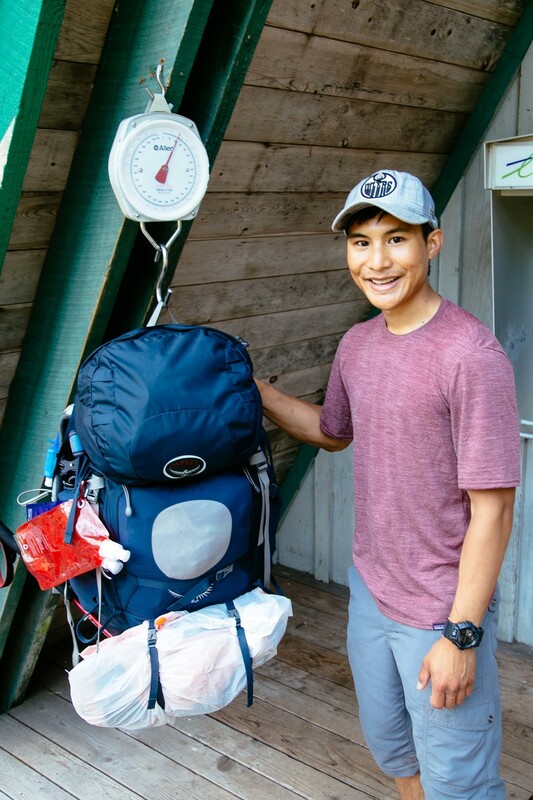 The WCT Office also had a scale right outside for hikers, so we were all curious to see what each of our bags weighed, mine was 54 lbs. Shortly after the 8:45am mark, Butch (the ferry operator) quietly greeted us at the docks, checked our permits, and proceeded with his daily duties by giving us a lift across the Gordon River. Of course once we got to the trailhead, we had to take the ceremonial group photo. Starting at KM 75, the goal was to make it to the campsite located at KM 62 (Camper Bay). The first 5 km were not easy to say the least. There were tons of logs, rocks, ladders, and obstacles to climb, along with the constant elevation changes. We were averaging about 1.5 km/hr until KM 70. Luckily the next 8 km to Camper's Cove only took us about 3 hours, but even then it was still quite the jog. Unfortunately we had to sacrifice the beach access from Thrasher's Cove to the “hole in the rock” at Owen Point due to the rising high tide. We would have had to camp at Thrasher's Cove for the night, but with the plan to finish the trail by Thursday, we just couldn't do it. By the time we got to KM 66, we unanimously agreed to take a slight detour from “Beach Access B” to “A”. It was definitely a good change of scenery as opposed to the forest. I highly recommend taking any beach routes whenever you can. The terrain is definitely a lot flatter and faster to walk on. Once we finally reached our destination at KM 62, we discovered our first cable cart on the trail. With the extremely dry weather this past summer, hikers were able to cross the creek by foot, but no one passed up the chance to experience the cable cart ride for themselves!